existing serial connection to the PC used to program the "BASIC Stamp". A "BASIC Stamp" can use it to for instance display graphics, or store/read data on harddisk or in PC memory. indicators and meters. Also it can be used for sound with MP3 files, video files or provide digitized speech. where too limited and expensive. Also it was not that easy to store data collected by a "BASIC Stamp". I realized there was a PC connected to the "BASIC Stamp", so i decided to make a graphics display emulator. You can use line commands to draw graphs, but also plot dots in full color to do a "scan". for the measurement or process besides the "BASIC Stamp". -Provides a big full color graphical display, which can be saved to disk as picture on command. -Provides an editable GUI for "BASIC Stamps" with buttons, indicators, regulators, meters etc etc. -Provides an ANSI (color) text window for debug text output. -Can use the harddisk of a computer to store or load data. -Has a system so a "BASIC Stamp" can detect if it is connected (docked) to a PC to store collected data. -Can play MP3 and video files or streams in the window started from the "BASIC Stamp". -Can generate synthesized voice sound and beep sounds. -Can send text messages to a log file with time and date. -Provides a Real time clock. -Runs on Windows and Macintosh (should also run on Linux). -Remembers the last used serial port and speed from a previous run. Functionality has be expanded over time. it is "docked" and then send all its collected data to the PC for storage. Also the "BASIC Stamp" can read data files from PC. 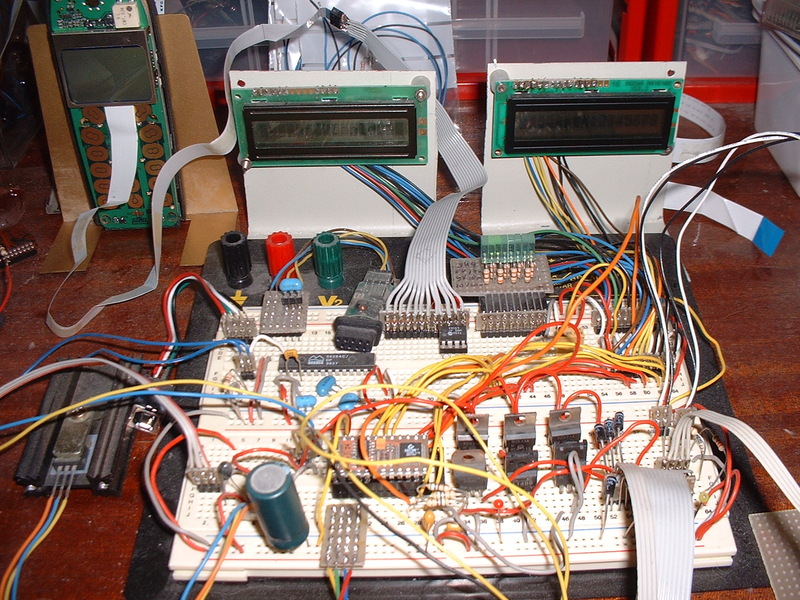 It can display graphics, using colored plot, lines and rectangle commands. It can even save the graph to disk using the IFF file format. use it to control you application via a drawn GUI in the graphics pane. The software is able to make sound, like digitized voice or simple "beep" through the PC speaker. It can even play sound and video files like MP3, WMV or MPEG using DirectX and Quicktime. The "BASIC Stamp" can request the time from the PC like it is a Real Time Clock. a lot of I/O pins which you can use to collect data, or drive hardware. be used. The GUI of the program is completely configurable with a text file. The fields can be enlarged, parts can be removed, it can be made fullscreen etc. Stampdock works by sending command strings from the "BASIC Stamp" using the 'Debug' command to the PC. can be read with the 'Serin' command. a text or a list of numbers can be given depending on the command. The string is ended with a ; character. There exists Windows, Mac and linux versions of the software. the "BASIC Stamp" you want to use. a human editable/readable file on disk. So you need to set it only once. For a "BASIC Stamp" select 9600 baud, and for a "Javelin Stamp" 28800 baud. On a PC the build in serial port seems to be COM1 or COM2. I tried a USB-Serial adapter on windows and it seems to appear as COM8. to software will use the first USB-serial adapter it finds in the system. Note that the Mac PPC version seems to run better as the Mac Intel version on Intel Macs. Note that the software has a "Scan" button that will try to locate the "BASIC Stamp"
port by sensing the connected DSR and RTS pins. But if you have a bluetooth adapter that has a port number lower as the "BASIC Stamp"
port that might be detected instead of the "BASIC Stamp" port. The software also has a "Reset" button that resets the "BASIC Stamp". The GUI of the program is defined in the stampdock/stampdock.rsrc text file. Note that the file was edited on a Mac, which might have influence if you try to edit it on a PC. the need of adding GUI elements. You can add or remove elements later. also parts can be removed or added or put on another place. In the GUI you can use pictures, background colors or patterns, tabs or triangles. The window can even be made fullscreen. Note that GUI development is described in another document. The software uses the serial connection normally used to program a "BASIC Stamp". To read data from the software you need the SERIN command. but the number for 9600 baud is different for some "BASIC Stamp" types. special case of SERIN where you dont need to specify baudrate. for the send line, which means you cant receive and send at the same time. for "Javelin Stamps" set the serial speed to 28800.
of print commands to send all parts of the command. javelin has no garbage collection, its memory will fill up, as string build can not be recovered. So if you use to much of these commands the javelin will not be able anymore to send commands. System.out.println("!a"+x+";"); // DONT USE THIS ! the byteAvailable command to check first if there is data set ready before doing any reading. Or maybe it is possible to use the UART class ? out yourself how to send or receive serial data. However, I might try it with a scenix/ubicom SX28 in the near future. Commands are loosly based on the old ANSI codes which where used to have color in old terminals. So commands are in human readable text form. Some commands can have a textstring instead of numbers. case the software will be sending data back over the serial port. user lowercase and uppercase character but they give the same result. might be used for new commands. Give a command: "!i21,10;" sends command 'i' with parameters 21 and 10. Give a command with string: "!zText\r\n;" sends command 'z' with "Text\r\n" as argument. Request data: "?i21;" request data with command 'i' and parameter 21.
and newer commands are upper case. To open a file the !oN; or ?oN; command is used, where N stands for the functionality. Use a ? for opening a file for reading, and a ! for opening a file for writing. 2 means add value NNN to the name, and 3 means no number in name. and then you can "poll" the software to check if there was a mouse click. The following commands draw on current position and increase x position, so to draw a "scan"
only need to send the color wanted. From version 2, the software has GUI elements. be read or set from the "BASIC Stamp". can be moved around, added or removed. Up to 256 active GUI elements can be used in a GUI at the moment (probably more). Note that GUI elements have an ID in the stampdock.rsrc of 1000 and higher. But from the "BASIC Stamp" they are called with an ID of 0-255 .. so you have to subtract 1000.
indicators: RGB LEDS , Analog meters, bar graphs, text fields. Regulators: slide switches, potentio meters, toggle switches, buttons, checkmarks, string gadgets. "BASIC Stamp" can control their position. There are a couple of commands to control GUI elements, with the command 'j' you can set color of an RGB LED. the first number after the j is the ID in the GUI resource file minus 1000. Followed by 3 numbers for Red, Green and Blue values. Or one value that indicates the state. Where 0 is black, 1=red, 2=green, 3=blue and 4 is white. To control the other GUI elements the 'i' command is used. The i is followed by the the ID number in the GUI resource file minus 1000. After that you place the value you want to set it too, which can be from 0 to 255. Note that the value of most GUI elements can also be read. they can also be set or reset with the 'i' command from the "BASIC Stamp". if they where set by the 'i' request. These are 'slide' switches that can have 2 or more positions, they can be read with the the 'i' request. You can also put them in another position from a "BASIC Stamp" with the 'i' command. These are regulators that return a value of 0-255 depending on the position of the slider. You can also set them by a "BASIC Stamp" to send to them a value of 0-255. These are analog indicators that of which the position can be set by sending them a value of 0-255. These are text fields in which you can display a number by sending a number value from a "BASIC Stamp" with the 'i' command. These are text fields with manual input that can be read and written from a "BASIC Stamp". These are indicators that can display 3 colored up, middle or down arrows or block. The first three bits of the value send indicate of the arrows or block are 'on'. has been clicked one or more times the value '1' is returned. twice .. before a read it will still return twice with the value '1'. of reads or writes once .. which increases throughput on the serial port. Added buttons for higher serial speed, for use with microcontrollers with high speed serial connection. sin, cos and random commands ? Setup used to test software. This is a "BASIC Stamp" from Parallax it is a tiny controller which can be programmed very easily from a PC. It has space for kilobytes of program code and dozens of bytes for variables.